l-r: Taylor Breeding, Caitlin Barnett, Sheri Thomson, Beth Huff, Morgan Crosby, CHA reviewer Millie Binkley, Laura Kirkley, CHA program director Polly Haselton Barger, Brandon Oates, animal science instructor and barn manager Kathi Jogan, Amanda Patton, Eugenia Fletcher, Mackenzie Curtis and Brooke Satterwhite. FAYETTEVILLE, Ark. –The D.E. King Equine Program in the University of Arkansas’ Department of Animal Science has earned national accreditation and certification from the Certified Horsemanship Association following an extensive on-site review. The equine program, housed in the Dale Bumpers College of Agricultural, Food and Life Sciences, hosted the review team March 31 through April 3 as it reviewed compliance standards and observed management of the following: horses, student staff, volunteers and equine facilities. Reviewers also monitored protocols and rules, and tracking systems at the D.E. King Equine Pavilion. Since 1967, the Certified Horsemanship Association has promoted excellence in safety and education for the benefit of the horse industry by certifying instructors and accrediting equine facilities. To earn accreditation, equestrian programs must meet CHA standards in areas of safety and liability issues, operation of the program, and management of facilities, activities and horses. The Equine Facilities Manager Certification process is a 20-hour clinic which evaluates participants on skills and knowledge of facility and horse management. Participants demonstrate skills and take written tests at levels up through Level 4 certification. Level 1 is a stable worker, qualified to work in a barn under supervision of a manager; Level 2, stable manager, qualified to manage a small private stable of up to 10 horses with one or two employees; Level 3, herd manager, qualified to manage a public facility of up to 35 horses and three or four employees; and Level 4, equine facility manager, qualified as general manager of a commercial operation with more than 35 horses and five or more employees. 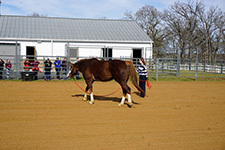 Nine students, along with Jogan, participated in the clinic. Jogan earned Level 4 certification while all nine students earned either Level 2 or 3. “Never has anyone achieved the perfect scores recorded by Dr. Jogan on the CHA EFM Level 4 Certification review in the 10 years this program has been in place,” said Haselton Barger. Students completing certification were Caitlin Barnett, Taylor Breeding, Morgan Crosby, Mackenzie Curtis, Eugenia Fletcher, Laura Kirkley, Brandon Oates, Brooke Satterwhite and Sheri Thomson. Barnett, Curtis, Fletcher, Kirkley, Satterwhite and Thomson are animal science majors. Breeding is in agricultural economics and agribusiness, Crosby in child development and Oates kinesiology. Jogan was awarded a grant from the American Quarter Horse Foundation last spring, which funded the accreditation and certification process. 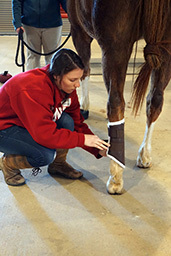 The Bumpers College offers an equine science concentration for animal science majors and an equine science minor for students with other majors. All U of A students are welcome to participate in equine activities at the King Equine Pavilion, which is home to 10 horses.